As on each of the previous days of the cruise, the morning of 14 April was cold and wet. Grey clouds stretched out to the horizon, a strong wind was blowing and the ship was riding sizeable swells. It looked unlikely that conditions would permit the remembrance ceremonies that were planned to take place on Journey's open decks that night over the Titanic wreck site. The plan called for Azamara Journey to arrive at the site in the evening. There, she was supposed to rendezvous with the Balmoral. However, Balmoral had had to divert from her planned course in order to allow a helicopter to evacuate a passenger for medical reasons. She had also encountered heavy seas in the eastern North Atlantic. Consequently, there was some doubt as to whether she would make it to the site in time. By late afternoon, there were a few breaks in the clouds. It was still quite cold but at least there was hope that the event would not be a wash-out. The evening began much like any other evening on the cruise with passengers assembling in the main dining room for dinner. Although the ceremonies were not scheduled to begin until just before midnight, there was no after-dinner live entertainment scheduled for the ship's main entertainment venue, the Cabaret Lounge. Instead, there was a showing of the 1997 feature film “Titanic.” Although everyone onboard had already seen the film, the Cabaret Lounge was quite full with several passengers weeping openly. At the same time, a few passengers drifted in and out of the showing as there was a restless tension in anticipation of arrival at the site. At about eleven, I ran into a friend who told me that Balmoral was now outside. Stepping out onto Journey's open decks, I saw that Balmoral was quite close, seemingly much closer than you typically see another cruise ship at sea. She was brightly lit both by her own lights and by what appeared to be television lights at her stern. (The BBC was said to be broadcasting live from Balmoral). The lights reflected on what was now a calm but black sea. If you listened closely, you could hear the waves washing against the sides of the two ships. Looking away from Balmoral's lights, I could see that the clouds had parted and a multitude of stars were above us. There was no moon and so the stars were in stark contrast to the overall blackness of the sky. Captain Ikiadis later told his passengers: "I have been at sea 28 years now and I have never seen anything like it." After the announcement, both Azamara Journey and Balmoral sounded their horns to mark the anniversary of the moment when the collision occurred. Then, on both ships, a somber reading of the names of all those who were on Titanic took place. The remembrance activities were scheduled to span the time from the anniversary of the collision until the anniversary of the sinking at 2:25 a.m. on the 15th. At one point, a pair of bagpipers played "Amazing Grace" on Journey's lobby staircase. At another point, a re-enactment of the CQD distress signal sent by Titanic was broadcast over Journey's public address system. Inasmuch as the passengers were going to be awake into the early hours of the morning, an extensive "Midnight Buffet" was laid out in Journey's main dining room. It was a beautiful spread including extravagant desserts that would have been hard to resist at other times. However, few seemed interested in indulging and those that came into the dining room seemed more driven by curiosity than hunger. Above: Bagpipers playing Amazing Grace. Below: A television crew films the Midnight Buffet. Balmoral positioned herself over the place where Titanic's stern lies while Azamara Journey positioned herself over Titanic's bow. 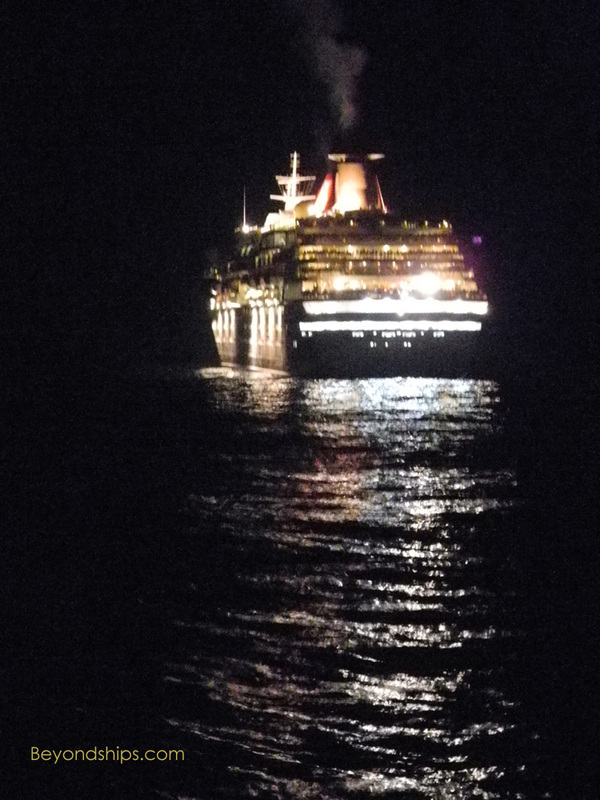 Most passengers seemed to spend the time talking in small groups or bundled in warm clothing on the open decks staring out at Balmoral or into the darkness. Although it was less then three hours all told, it seemed like a long time. Thus, you could see how there was enough time for all of the stories that reportedly occurred on Titanic to have unfolded. One could not help but think about what must have been going through the people's minds at this location 100 years before. The lights of the Balmoral, like those of Titanic must have been, were the only signs of civilization in this desolate place. You could see why some people were reluctant to board the lifeboats and go out onto the dark cold waters. For those who had no place in the lifeboats, it must have been like staring into the abyss. Off in the far distance, there were brief glimpses of what appeared to be another set of lights. On that night 100 years before, people said that they had seen the lights of another ship in the distance. Was this the ghost of the Californian, the nearby ship that failed to respond to Titanic's distress calls? Later, some of Journey's passengers postulated that it was the lights of HMCS Halifax, which had dropped a wreath at the site earlier in the evening. Others said they were shooting stars near the horizon. It was an eerie sight regardless. Above: The blessing of the wreath. Below: The Unfinished Band plays "Nearer My God To Thee"
At about 2:10 a.m., a memorial service began on Journey's pool deck. It included prayers and readings from the Bible. A wreath was blessed and then taken down to the promenade deck where it was cast into the sea. Meanwhile, two services were being conducted on the larger Balmoral. Commodore Warwick, who conducted one of those services, recalled: "It was very emotional. You could hear a pin drop throughout those services and on the deck after." The services were followed by the sounding of Azamara Journey's horn, which was answered by the horn on Balmoral. The Unfinished Band, a group of musicians who had gathered for the cruise to commemorate and complete the voyage started by Titanic's musicians, then played "Nearer My God to Thee," the hymn traditionally believed to have been the last song played before Titanic sank. Just as the musicians finished, the lights on Azamara Journey's upper decks were dimmed. Darkness engulfed the passengers on deck and it seemed even colder and the ocean looked even lonelier. But there on the horizon, as if following a stage cue, the moon was rising. There was very little conversation. People just looked out to sea lost in their thoughts and then drifted away to their cabins. Conditions on the remaining three days of the cruise bore little resemblance to its beginning. It was as if we were sailing the Caribbean rather than the North Atlantic. The sun shined and the sea was calm. However, the memory of the anniversary night stayed with everyone onboard. The Moon rose just as the ceremonies ended.